Money Wise (Wijzer in Geldzaken) sounds the gong, together with other participating parties for the seventh edition of the Pension3Days. The purpose of this three-day fair is to promote financial resilience at a later age. In this context, Money Wise developed the “What should I do for my retirement?” tool. This enables people to make an assessment of their financial situation later in life. The pensioen3daagse includes pension consultations and awareness in the workplace. Insurers, banks and financial advisors also open their branches to people with retirement questions. Participants in the Pension3Days include the Dutch Authority for the Financial Markets (AFM), Pension Federation, the Dutch Ministry of Finance, the Dutch Ministry of Social Affairs and Employment, Adfiz, FFP, The Dutch Central Bank, Nibud, several banks, pension funds and insurers, trade unions, and many others. Theranexus is an innovative biopharmaceutical company specializing in the development of therapeutic products for the treatment of central nervous system diseases. Theranexus now has one product (THN102; a drug candidate combining a modulator of neuronal activity with a glial connexin modulator for the treatment of narcolepsy, a rare neurological disease) in Phase II clinical trial. 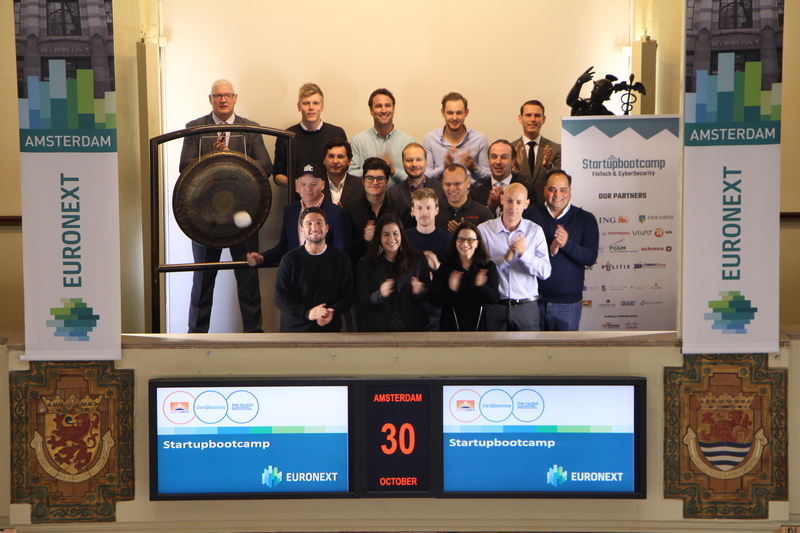 Startupbootcamp opens the trading day at the Amsterdam exchange for the kickoff of the Startupbootcamp FinTech & CyberSecurity program. Out of more than 500 applications, 21 startups in FinTech & CyberSecurity were invited to present their ideas to more than 140 mentors and partners. Out of this group 11 startups were selected to join the 2018 program. Founded in 2010, Startupbootcamp is a global network of industry-focused accelerator programs. With more than 20 programs in Europe, Asia, North and South America, and Africa, selected startups gain access to an international network of mentors, partners and investors. Up to date, Startupbootcamp accelerated 507 startups globally. 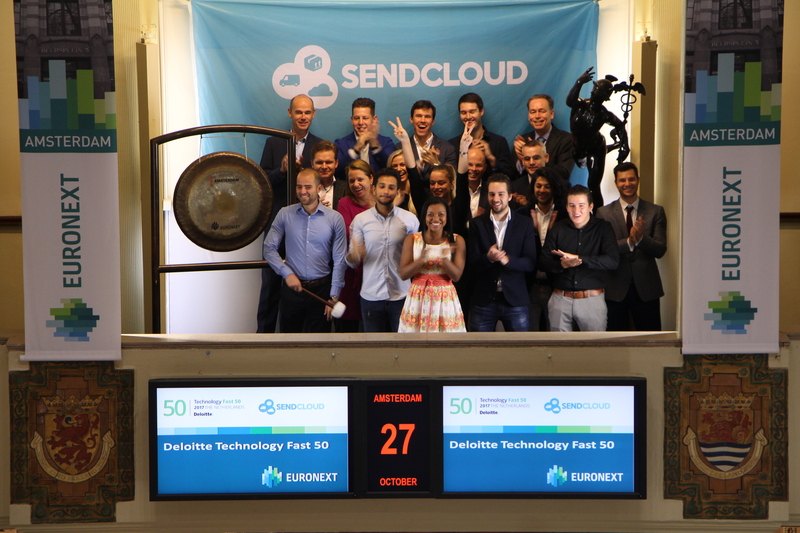 SendCloud, a company from Eindhoven, has been ranked number one in the Technology Fast 50 ranking 2017. With a sales growth of 5463% over the last four years, the company is at the top of the list of the fastest growing technology companies in the Netherlands. SendCloud has developed a tool that allows web shops to automate the entire shipping and return process, saving time and costs. Rob van den Heuvel, CEO of SendCloud, opens the trading day by sounding the gong. Deloitte organizes the Technology Fast 50 together with its partners ABN AMRO, Euronext, Kennedy van der Laan, Oracle NetSuite and Vitruvian. The Deloitte Technology Fast 50 is an election of the 50 fastest growing technology companies in the Netherlands. The annual program identifies which technology company has grown the fastest, in terms of percentage, over the last year in the Netherlands. The Fast 50 participants are the top entrepreneurs of the future who think quickly and play a leading role in their field. Annually, a Rising Star award is also awarded for emerging innovative companies younger than 4 years. In 2017, this prize was awarded to Camptoo. 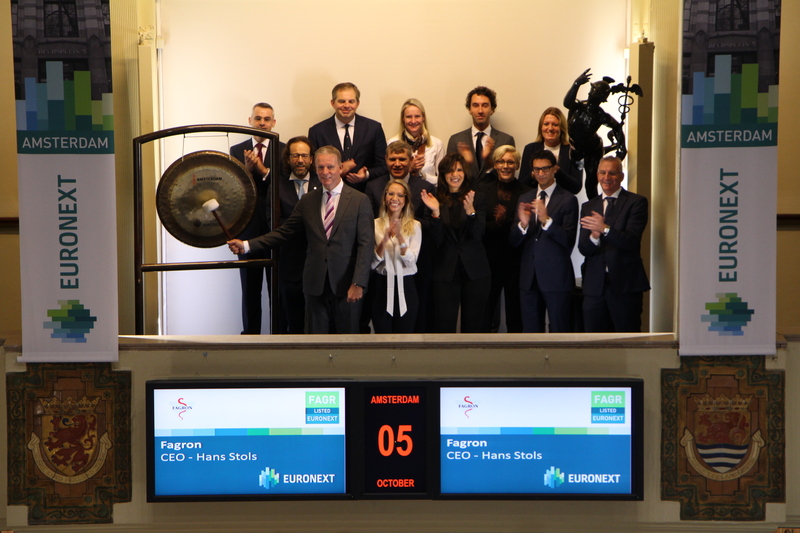 Euronext had the pleasure to welcome Hilmar Rode, CEO of Nyrstar, to celebrate the 10th listing anniversary of the company. Therefore Mr Rode opened the trading day in Brussels in the presence of Mr Chris Eger, CFO and Virginie Lietaer, Company Secretary. Nyrstar is an integrated mining and metals business with market leading positions in zinc and lead, and growing positions in other base and precious metals. 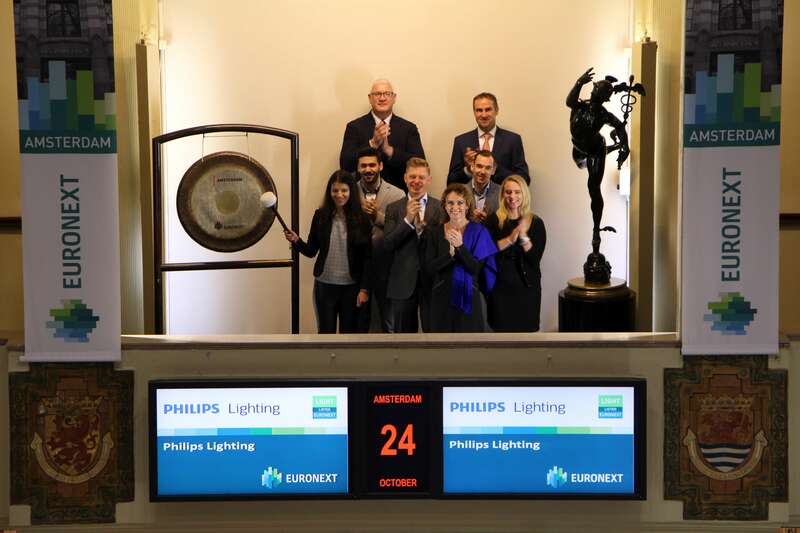 Nyrstar is listed at Euronext Brussels with trading symbol: NYR. Rabobank recently announced its global activation program, ‘Kickstart Food’, to accelerate the transition to a sustainable food supply. Jacqueline Pieters, Global Head Banking For Food Inspiration Centre, sounds the gong. One of the first steps in this program will be the launch of a one billion dollar facility to initiate land restoration and forest protection initiatives. The facility is being launched in partnership with UN Environment. It marks the start of a three-year initiative to kick-start and scale up Rabobank’s support for clients and partners in the transition to a more sustainable food and agricultural sector. The Kickstart Food initiative has four key focus areas: Earth, Waste, Stability and Nutrition. 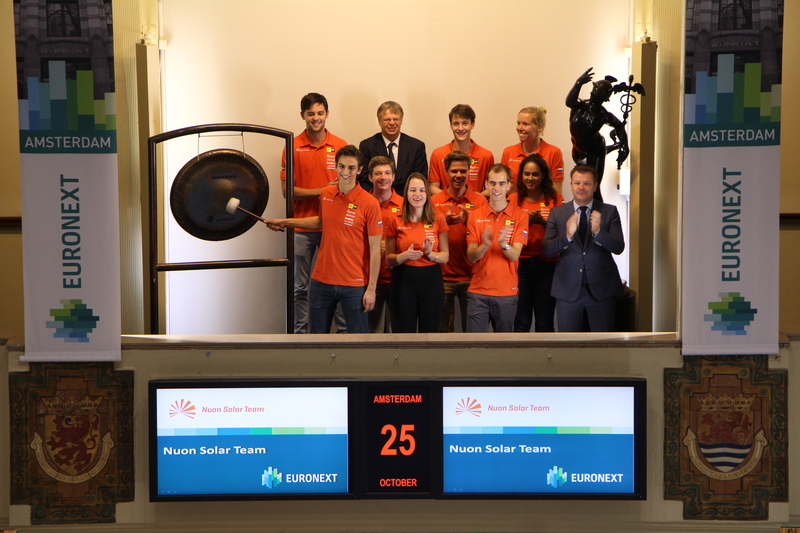 The Nuon Solar Team opens the trading day at Euronext Amsterdam in celebration of their victory at the world championship solar car racing in Australia. With this occasion they, moreover, herald the start of a new year. One in which they will work towards another race and, more than ever, focus on high-tech innovations. The Dutch teams lead on the looming competition was becoming increasingly smaller for the last couple of years. However, this year, the Nuon Solar Team has left their competitors from prestigious universities, such as Tokai (Japan), Michigan (U.S.A.) and Cambridge (U.K.) far behind. The radically improved design of their solar car Nuna9 and their strategy have enabled the students of Delft University of Technology to drive full speed despite cloudy weather. Philips Lighting (ticker symbol: LIGHT), a global leader in lighting, sounds the gong for their new #smarthome campaign. Recently, Philips Lighting launched a campaign in which the company shows how Philips Lighting influences consumers’ lives with ‘the most connected light in the world’. Philips Hue, the personal wireless lighting system that allows light to be easily operated and creates the right atmosphere for any moment, is more than just light and it's helping to make the #smarthome a reality. Martijn Paulen, director of the Dutch Design Foundation and organizer of Dutch Design Week, opens the stock exchange with his colleagues and Ilona Roolvink, sponsor manager ABN AMRO. By sounding the gong they want to draw attention to the annual Dutch Design Week (DDW) which takes place in Eindhoven this week, and also highlighting that ABN AMRO prolongs their main sponsorship with DDW through 2019. DDW is the largest design event in Northern Europe. DDW presents works and concepts of over 2600 designers to 300,000 national and international visitors. Spread across hundreds of locations throughout the city, DDW organizes and facilitates exhibitions, lectures, prizes, networking, debates and festivals. DDW distinguishes itself from other design events by focusing on future designs. While the event covers all imaginable disciplines and aspects of design, emphasis is placed on experiment, renewal and cross-overs. Special attention is paid to work and development of young talent annually. ABN AMRO (ticker symbol: ABN) is also main sponsor of DDW for the next three editions. With the extension of the sponsorship until 2019, the bank commits itself to the organization of Driving Dutch Design, a special talent program for young designers. 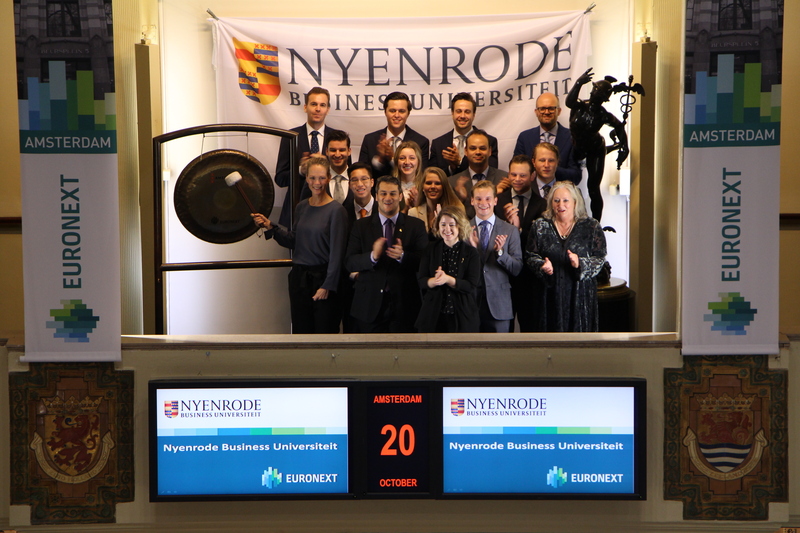 Students of Nyenrode Business Universiteit open the Amsterdam exchange for the university’s expansion to Amsterdam. As of September 2017, the first full time MBA students began their education at Nyenrode’s Amsterdam campus. Next year, the seperate full-time Master of Science in Management track will kick off at the Keizersgracht location. Nyenrode is a private university, founded in 1946 by and for business and with an international orientation. The university is working on a sustainable future by encouraging students and participants to become responsible leaders. This is done by providing intensive academic programs, and short and longer programs in the fields of business, management, accountancy, controlling and fiscal law. 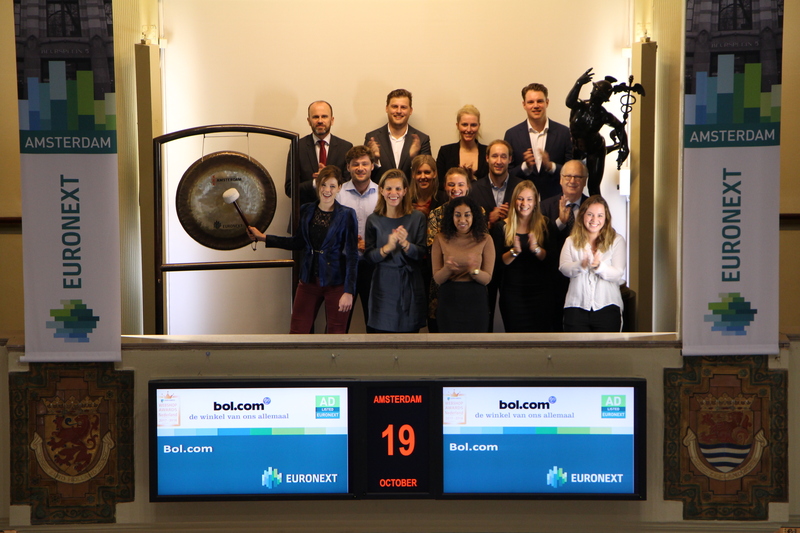 Bol.com, part of Euronext listed Ahold Delhaize (ticker symbol: AD), has won two prizes during the yearly the ABN AMRO Retailer of the Year awards and sounds the gong at the Amsterdam exchange. Bol.com has been elected as best webshop of the Netherlands in the categories Books and Music, movies & games. This year, over 260,000 Dutch consumers have rated more than 450 retailers for the ABN AMRO Retailer of the Year awards. Consumers have rated their favorite retailers on aspects related to price, service and assortment. Market Wizards sounds the gong with an eye on the future and MiFID II. Market Wizards is keen to enter into partnerships with trading companies that want to focus on trading but at the same time, want to ensure that business is compliant with what MiFID II demands. 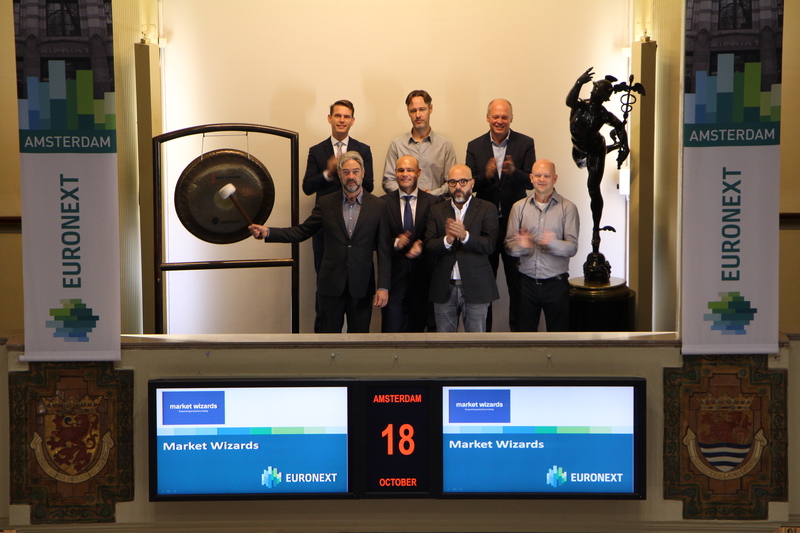 Established in 1999, Market Wizards, located at Beursplein 5, is a Dutch proprietary trading firm engaging in day trading, market making, high-frequency trading and electronic execution. The firm operates two sophisticated dealing rooms in the Netherlands, Amsterdam and Den Bosch. Market Wizards has also expanded its management, since 1 October 2017. 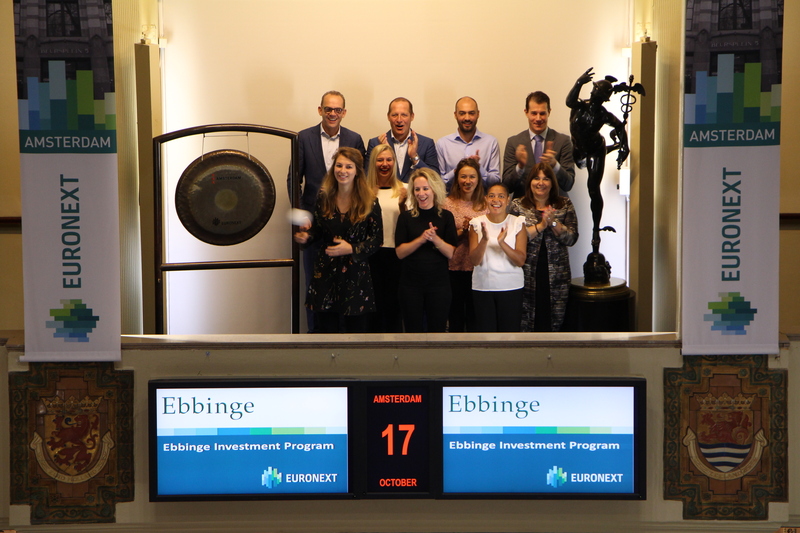 For the kick-off of the Ebbinge Investment Program 2017-2018, Ebbinge opens Euronext’s Amsterdam exchange. The third edition of Ebbinge's Investment Program started recently with a career event involving students and private equity parties. This initiative allows a selected group of around 50 top students to meet the world of private equity and leading private equity houses during a college year. Ebbinge has been a consultancy firm in the field of Search, Interim and Advice for over 30 years. With offices in Amsterdam and Brussels, it is focused on the strengthening and development of people and teams in management, senior management and supervisory positions in the enterprising industry and public sector. Pascal Saguin , CEO of Adeunis,opens the trading day in Paris. wireless communication systems: audio conferencing systems and portable radio terminals for secure and confidential communications in noisy or harsh environments, sold under Vokkero brand. 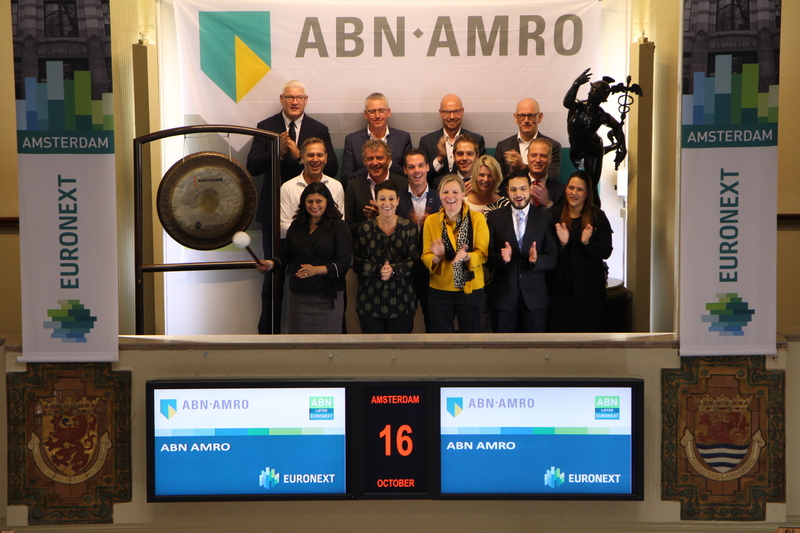 ABN AMRO (ticker symbol: ABN) opens the trading day at Euronext’s Amsterdam exchange. They do this for the return of Options trading ABN AMRO to Euronext. "Operations Securities is responsible for processing all securities transactions for the Retail and Private Banking customers of ABN AMRO", says Ria Soedhoe, Director Operations Securities at ABN AMRO. "It is a flourishing business, especially since ABN AMRO introduced the easy to use and customer friendly mobile banking app. 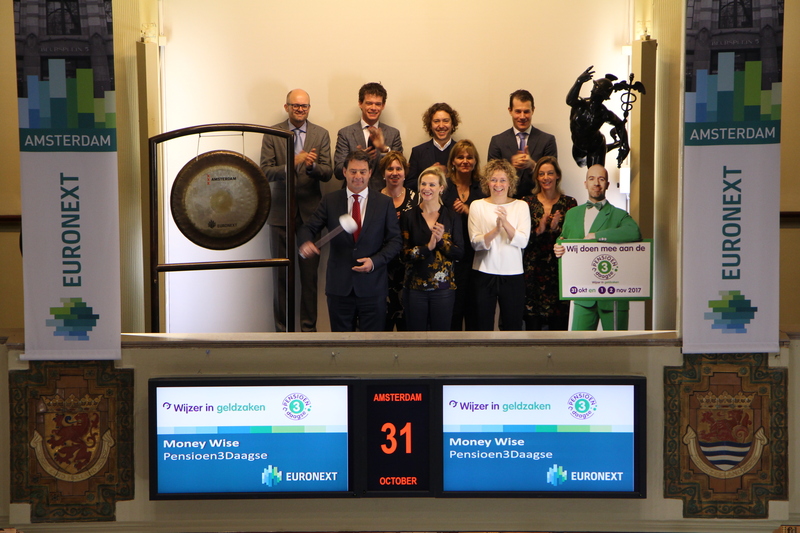 The transformation of our old securities platform has been completed, allowing us to return the business to Euronext. We are very excited to be back after three years. 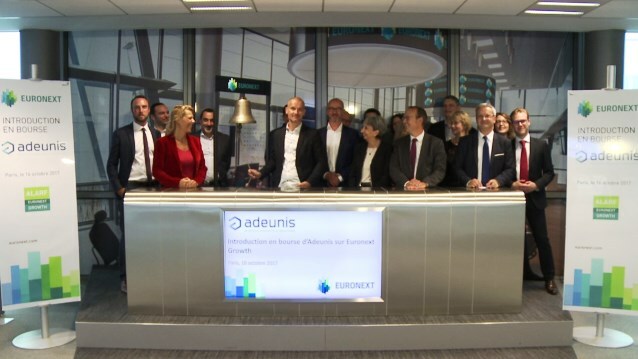 Euronext is a solid and professional organisation that offers the stability and continuity of services we require to offer our clients excellent trading services now and in the future. " Olivier Wigniolle, CEO of Icade, and Victoire Aubry, CFO, celebrate the launch of their first Green Bond. As an investor and a developer, Icade is an integrated real estate player which designs innovative real estate products and services adapted to new urban lifestyles and habits. By placing corporate social responsibility and innovation at the core of its strategy, Icade is closely involved with stakeholders and users in the cities— local authorities and communities, companies and employees, institutions and associations… As a commercial and healthcare property investor (portfolio value of €9.9bn as of 06/30/17) and as a property developer (2016 economic revenues of €1,005m), Icade is able to reinvent the real estate business and foster the emergence of tomorrow’s greener, smarter and more responsible cities. Icade is a significant player in the Greater Paris area and major French cities. Icade is listed on Euronext Paris as a French Listed Real Estate Investment Company (SIIC). Its leading shareholder is the Caisse des dépôts Group. Etienne Binant, Chief Executive, Biom'up, opens the trading day in Paris. Biom'up specializes in research, development and manufacturing of implantable and resorbable collagen-based medical devices for surgery and regenerative medicine. The group especially offers haemostatic products that help control bleeding during surgery (Hemoblast) and collagen membranes that prevent organ adherence during surgery (Cova). 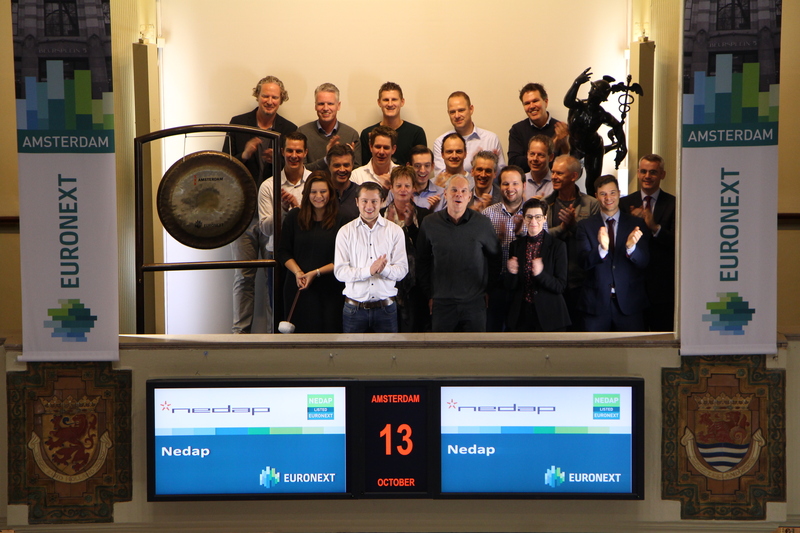 This year, Nedap has been listed to Euronext’s Amsterdam exchange (symbol: NEDAP) for 70 years. 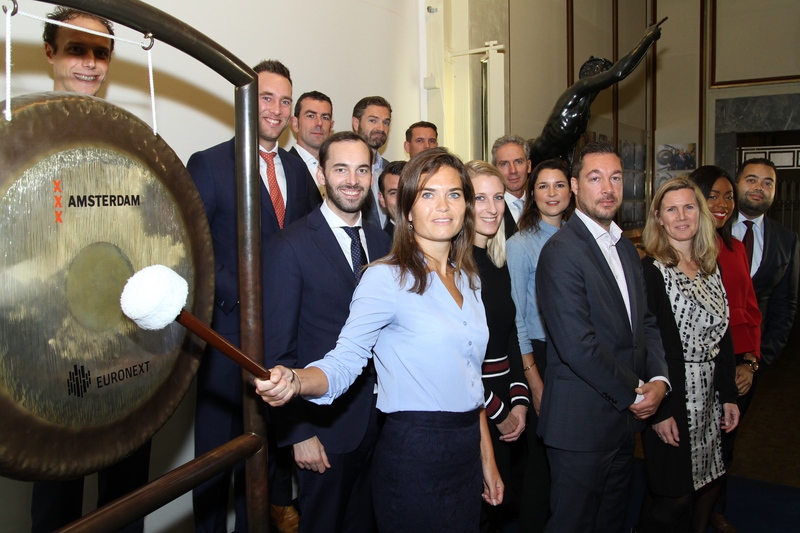 To celebrate this, the technology concern opens the trading day at the Amsterdam stock exchange with the traditional gong ceremony. Founded in 1929, the Dutch Appliances Factory "Nedap" has been listed on the exchange since 1947. Today, Nedap supplies technology for various sectors such as healthcare, security management and retail. Nedap therefore believes that technology can make a significant contribution to solving major issues in these, and many other sectors. 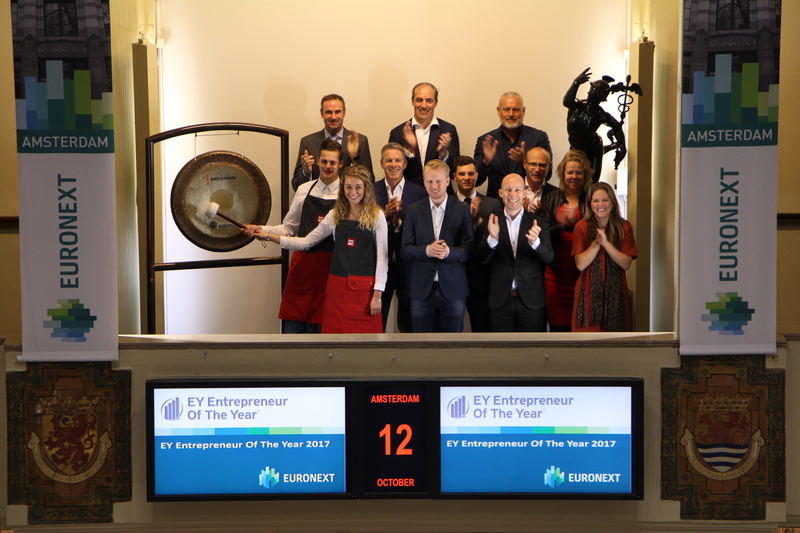 Michiel Muller has been awarded the EY Emerging Entrepreneur Of The Year Award 2017 and therefore sounds the gong together with his colleagues and opens the trading day at Beursplein. Muller, co-founder of online supermarket Picnic, received the award from the jury chairman Jan Kees de Jager, CFO at KPN. The jury calls Muller an entrepreneur who shows that a changing world offers opportunities, especially in sectors where major players traditionally dominate. This entrepreneur has convinced and inspired the jury with his vision, courage and perseverance. The EY Entrepreneur Of The Year award has been awarded in over sixty countries for over 30 years. The award is intended to put entrepreneurship on a pedestal and encourage and support entrepreneurs to get the best out of themselves, their clients and their employees. Tijn van Elderen, CEO of Brabantia has been crowned the Entrepreneur Of The Year 2017 by EY. The oeuvre award for family companies was awarded to Agio's Wintermans family. AkzoNobel and Plan Netherlands open the trading day for International Day of the Girl. 22-year-old Dunya Veenhof sounds the gong. On Day of the Girl, five hundred girls in 60 countries take over the role of a politician or director of a company for one day. Takeovers on International Day of the Girl, like a girl stepping into the role of mayor of Paris, illustrate what girls can achieve and the positive economic contributions they can make – if they get a fair chance. Through the Human Cities Initiative, AkzoNobel has been active for years in adding color to the world and creating an inspirational place for everyone. As part of that effort, Plan Netherlands and AkzoNobel have been working together for more than 20 years to create better living conditions for children and young people in developing countries. This strategic partnership emphasizes helping disadvantaged youth through targeted vocational education programs to access labor markets. By sounding the gong chairman of the Brainport Foundation and mayor of Eindhoven, John Jorritsma celebrates the ten-year anniversary of the Brainport Monitor together with (former) employees of Brainport Development. The Brainport Monitor is an analysis of the economic and innovative strength of Brainport Eindhoven. The monitor provides over 30 statistics, ranging from subjects such as business, export, and jobs. 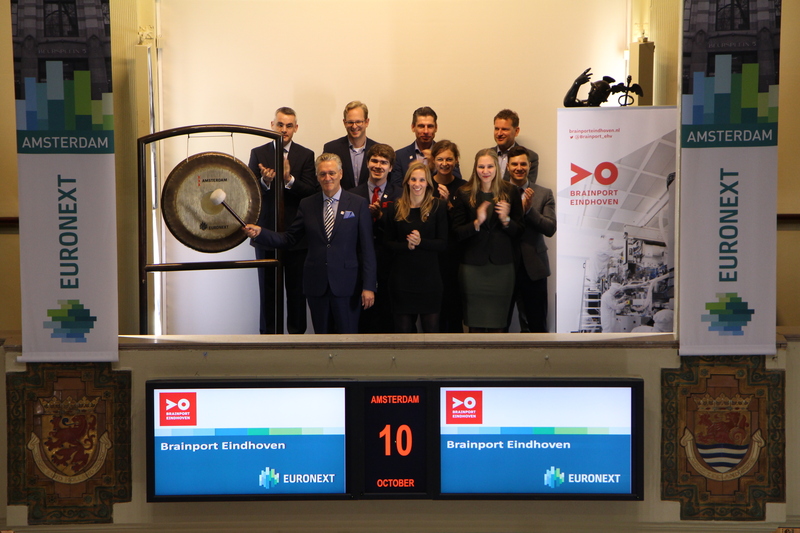 All backgrounds and knowledge about the progress, innovative performance and changed competitive position of Brainport Eindhoven are featured in the Brainport Monitor. John Jorritsma, Mayor of Eindhoven and Chairman of the Brainport Foundation launches the tenth edition of the Brainport Monitor during a festive anniversary gathering. Robeco celebrates Robeco ONE’s fifth anniversary by opening the Amsterdam exchange. Robeco ONE is the successful all-in-one investment proposition for private investors. It has grown to around 30,000 customers since its launch in 2012. The managed assets increased to almost 1 billion euros in five years. The underlying aim of introducing Robeco ONE in 2012 to make investing accessible and approachable for everyone has been a success. The three variants of Robeco ONE (defensive, neutral and offensive) give investors access to all of Robeco's know-how, fund managers and advanced investment strategies. At launch, Robeco ONE was the first low-threshold total solution and set the market in motion. Communication agency Citigate First Financial changed its name to CFF Communications. 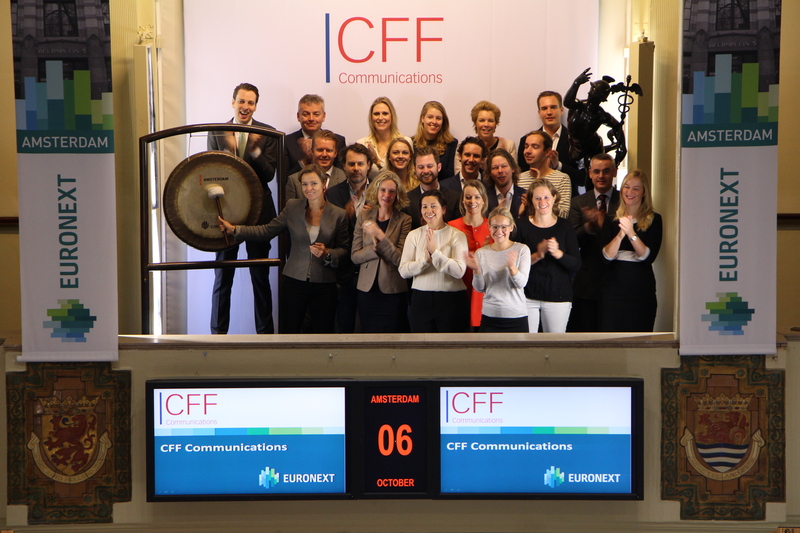 To celebrate its renaming and 25th anniversary, CFF Communications will sound the gong to open trading at the Amsterdam stock exchange. CFF Communications started 25 years ago as a financial communications and investor relations bureau. CFF Communications now supports customers in all aspects of corporate communication. Uneke Dekkers, Managing Director: “Over the past few years, we have significantly expanded our proposition to clients. Now, it is time our name better reflects the increased scope of services. Our 25th anniversary is the perfect moment to change our name to CFF Communications. This new name not only refers back to our origins but also represents the broad corporate communications role we now fulfil for our clients. Fagron N.V. (ticker symbol: FAGR) celebrates its 10-year listing anniversary with the sounding of the gong by CEO Hans Stols. 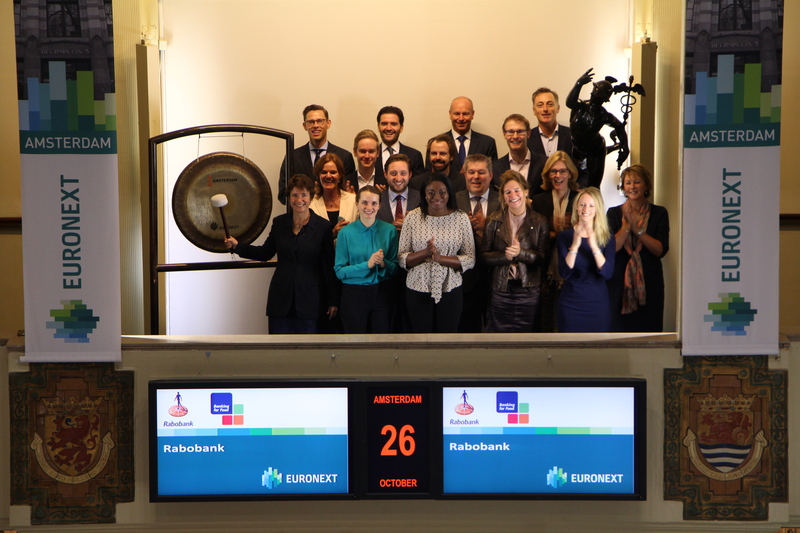 Fagron has been listed on Euronext Amsterdam and Euronext Brussels since 5 October 2007. With the completion of the sale of its dental and medical divisions in 2014, and the sale of the software division in 2015, Fagron has been transformed into a leading company active in pharmaceutical preparations. Fagron focuses on providing personalized care to hospitals, pharmacies, clinics and patients in its core markets Europe, North America and South America.